At 5:05 I’ll look to the northwest for a bright object moving toward the northeast. If it’s moving slowly and not blinking, it’s the International Space Station. Population: 6. I’ll wave to Daniel, Anton, Anatoli, Oleg, Donald, and Andr�. At 5:07, when the ISS is as far up as it’ll get in the northeastern sky, I’ll look to the southwest for a dimmer object moving toward the northeast. 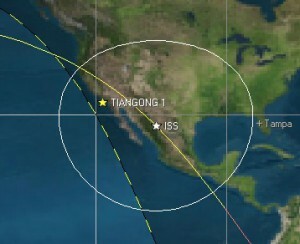 If it’s moving slowly and not blinking, it’s Tiangong 1, the first part of China’s space station. Population: 0 so far. Until about 5:10, when Tiangong 1 is right overhead and ISS drops below the eastern horizon, I’ll watch the two of them share the sky. Thanks to Allan Manangan for passing along the news from David Dickinson on Twitter.